Mama Baraka was one in a million, and bravely faced the tribulations of violence. Her body language told me that she was none too happy about having us there and I could not blame her. But actually there was more to her story that I didn’t know about at the time! Mama Baraka was the wife of my boss, Big E, the Director of Hifadhi my partner organisation, and we, on his bidding, had inadvertently imposed on her living conditions. Hifadhi were supposed to accommodate us and funds had been provided through the Agency for that very purpose - as well as for our assignment. However Big E and the treasurer, had used the money to build a bar and restaurant, blandly telling me later ‘as an income generating project for Hifadhi. The family, led by Big E lived in a large, western style house and had sealed off a couple of rooms that were to be our quarters, but it was only partly completed because they had ‘run out of funds’. The Agency put pressure on Big E because in the interim we were staying with our Field Reps, which was not a sustainable long term arrangement. So Big E moved his family, including three teenage boys and 6 year old Nai, out of their home and into our unfinished couple of rooms. We had to do some painting and cleaning before we moved in and I was not happy about the appropriateness of what he had done. So that is why I reckoned Mama Baraka was not too happy with us! Much later as our friendship deepened she told us about a New Zealand woman who had taken a fancy to Big E, but hey that’s something I will not get into here other to say he was dog tucker as far as husbands go. I knew that the quickest way into a mother’s heart is through her children and Nai, her six year old daughter took to us from the start, deciding to teach us her version of Swahili. Mama Baraka’s three teenage sons wanted me to teach them English so we had no privacy pretty much from the start! Of the boys, I became best friends with the youngest, Olotu, who was the apple of his mother’s eye! Pretty soon we were new members of an extended family led by Mama Baraka who was one of the warmest beings that I have met! It soon became a daily ritual: I would have breakfast and perform my normal morning rigmarole, then on my way to the nursery, I would pass by where Mama Baraka was having her breakfast with some of her kids. ‘Karibu chai!’ she would always call, ‘Welcome for a cup of tea!’ Culturally it is not the done thing to refuse and in reality, I didn’t want to because although I drank my tea black and without sugar (medicine, she called it) hers was fifty percent milk and sweet, but I loved it! It was not unusual for me to sit with her for an hour after the kids had gone, just chatting and gossiping, sitting on the open air veranda. That is until Big E woke and poked his nose outside. With just a flick of the thumb he would indicate that he wanted her seat and she would respectively vacate it leaving him to chat, but that was my que to start work in the nursery! While Big E was fluent in English, Mama Baraka knew only a little, which was good because it made me brush up on my Swahili, and she taught me a lot about the language and how to use it in practice. And she enjoyed a good laugh! She taught me so many of the cultural nuances that helped during my time in the country. Such as after a meal, you say, ‘Thank you.’ To whoever provided or cooked it, and then after your meal, if the cook asks you to have more, you always accept, even a little bit. The cook will then thank you because it shows that you enjoyed the food. Politeness goes a long way in Tanzania. Mama Baraka was a big, dark woman who looked perhaps growly in a natural way, but when she cracked a smile it was like a full-blown sunrise! She often wore a plastic bag over her hair, in the hope it would straighten out her curls, but African hair does not straighten that easy. She loved her kids and was always trying to nudge young Nai in the right direction because she was such a free-spirited kid with a mind of her own and Mama wanted her to grow up with ‘proper’ traditional respect. A little ritual developed between us, which was to share each other’s cooking, especially when something out of the ordinary was cooked or in the weekends when Mama Baraka showed us how traditional meals are prepared. She would have Nai helping, but she was always rough as guts in whatever she did and Mama’s admonishing amused us and we would all end up laughing. She was well respected within the village and would include us with whoever was visiting her, which allowed us to experience the Maasai as they live day to day, albeit very different to the rural areas. Some of those contacts proved very useful over time. Because Mama involved us within the community we attended so many baptisms, confirmations, weddings and funerals. It was especially easy for us to like Olotu, Mama’s favourite among her sons. He was a little stunted and did not grow as tall as his siblings, I wondered about that, but the answer was revealed to us one day – patience has its rewards. Apparently Big E had decided that they would have only two children and when Mama Baraka conceived with Olotu, he blamed her entirely! As punishment he whacked her around in the hope, so she reckoned, that she would lose her baby, however Olotu was born ‘good and sturdy’. When he was three, he took sick with a disease that I could not interpret, but he was close to death! Big E was prepared to ‘let him go’, but Mama fought for him and scrounged enough money to pay for the medical bills. The lad survived but Mama was told that his growth would be effected, which was why he was short by Maasai standards. Olotu would do anything for his mother, and that transferred to us, because he was close to her he has turned out to be a fine young man. Again Big E was none too happy when Mama fell pregnant with Nai! Several times he tried to cause an abortion by hitting her stomach and once he tried to force her to take some concoction, but when a girl was born, he changed his attitude toward the infant. Big E had misappropriated funds, which is a whole tale on its own, but apparently before we arrived, Mama Baraka had admonished him for it, so his response was to give her some of the money to set up her own chicken rearing project! We arrived about the same time as her first lot of day old chicks! It was easy enough for her during the first season because no diseases occurred, but she did not have the skills to run the project efficiently so the birds were not ready for the Christmas high price she was expecting. This meant extra feed and a shortage of customers. So I took her around some of the restaurants around Arusha but they had established sources and were not keen buyers. However we managed to sell them but at an unfavourable price. The next season disease broke out early, so daily Olotu went to where the cattle are slaughtered to collect blood, which he dried and fed to the chooks but they didn’t really thrive even with that. Big E’s excuse was that his Suzuki broke down, so I was called in to cart the bags of feed, but soon he ‘ran out of cash’ to buy the feed. He had lost enthusiasm for the project. So to help Mama out and to keep the hens alive I gave her a little help. Again the issue of selling arose and again I helped out but she never turned a profit and so the project was abandoned altogether! There was a kerfuffle one morning and Nai came running for me. Big E was out of his tree! Probably on piwa, a traditional brew which is an illegal, head-blow-off-dangerous booze! He was going to throw Mama Baraka out in favour of some woman he had picked up on his travels the night before! I had mediated on arguments between them before, which was a taxing exercise but traditionally arguments are settled through a mediation process. But he wasn’t negotiating! Piwa usually glazes the eyes over but his were wild! I know very well that getting someone under the influence to be rational is like pushing muck uphill with a rake, nevertheless I told him that today Mama Baraka was cooking for his children, and advised him to ask the other woman if she is ready to do the cooking tomorrow. To my surprise he headed off towards the road, tripped over beside the bougainvillea hedge and fell asleep! He arrived back two days later and I called a meeting. Each had a list of complaints about the other and I listened, finally asking if they really wanted to part – no answer from either. I said that no answer is not a yes, so shake hands and agree to be peaceful. It all erupted again going over that same list! So I said to Big E that Nai (at least she was close to his heart) needed her mother, so if Mama Baraka was to go, he would suffer the loss of his daughter as well. He nodded. ‘We are finished then?’ I asked and stood up and they did too. For a while there was a coolness but later it settled to what was normal for them. We left Hifadhi for another assignment some twenty-five miles away but still kept in contact with Mama Baraka, but she was failing in health and her husband was his usual uncaring self! A few months after we returned to NZ, Olotu messaged us to say that Mama had a breast removed but she was fine. It was never any use helping Mama financially because Big E would booze it away! He had the key to the mail box. Before our return there, we contacted a friend who works with breast cancer patients and she gave us a prosthetic breast and a couple of bras to take to Mama Baraka. Mama’s eyes lit up and off she rushed off to try it on and it was perfect! She came out of her room and flashed it all to us! Pleased as Punch she was! For the next two years we regularly called on her and thankfully, seldom met Big E, although we always retained a good working relationship – with provisos. When visiting it is traditional to take something and we usually took meat or vegetables and always with the farewell handshake we left some money in her hand. 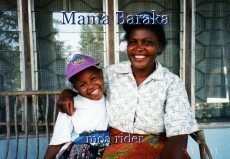 A year after our return to New Zealand Mama Baraka lost her battle with cancer! We sent our ‘other daughter’, Upendo to the funeral with a donation towards feeding people at the wake. Truly Mama Baraka was one in a million – but my oh my, she had it tough! Footnote: Violence, especially violence towards women and children is intolerable! The violence and abuse faced by Mama Baraka is mirrored worldwide, not only in third world countries, so if anyone is shocked about what happened to a gem like Mama Baraka, then I have achieved my goal.